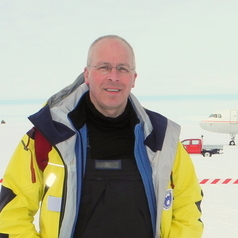 I lead the Program for Antarctica and the Global System within the Australian Antarctic Division (AAD) in Hobart and am based at the Antarctic Climate and Ecosystems Cooperative Research Centre (ACE-CRC). I lead a team of earth system and climate-related researchers across the fields of glaciology, marine-ecoystems, atmospheric and ice core palaeoclimate sciences. I have personal research interests in palaeoclimate from Antarctic ice cores and the role of Antarctic ice sheets in sea level. I am also more widely interested in earth system science, and presently chair the Australian Academy of Science's National Committee for Earth System Science. The AAD/ACE ice core group has particular experience in extracting very high detail climate records and connecting these with Southern Hemisphere and Australian regional climate records from instrumental data. Some of this work has highlighted connections between rainfall and drought in Australia and large scale climate connections in the Southern Ocean, as well as El Nino changes. Other research interests include airborne radar surveys to map the bedrock under the Antarctic ice. This is useful in our ongoing search to find the oldest ice for future ice coring, and it also allows for better modelling of ice sheet flow and resulting improved prediction of changes in a warming climate.